Our gourmet apples are hand-made using the finest creamy caramel and chocolates. Each one starts with a thick layer of caramel. Then one of our reknown toppings are applied. Next we coat the apple in a thick layer of either gourmet milk or dark chocolate. Finally they are drizzled with milk, dark or white chocolate and beautifully decorated in a seasonal theme. 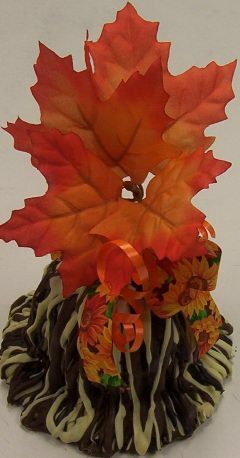 These lovely treasures make great gifts and are ideal as favors or table centerpieces at weddings and showers. Toppings available include pecan (the most popular) , mixed nut, honey roasted peanut, M&M and butterfinger. We suggest you order in advance to ensure that your choice of chocolate and topping is reserved for you. During peak holiday periods order at least one week in advance.